As of the census  of 2010, there were 21,415 people, 5,111 households, and 4,741 families residing in the town. The population density was 513.6 inhabitants per square mile (20.0/km²). There were 5,546 housing units at an average density of 133 per square mile. The racial makeup of the town was 91.9% White, 0.6% African American, 0.5% American Indian and Alaskan Native, 0.6% Asian, 0.6% Pacific Islander, 2.7% from other races, and 3.1% from two or more races. Hispanic or Latino of any race were 8.6% of the population. The three major roads running into Eagle Mountain are Utah State Route 73, which runs through the northern part of the city and along its western edge into Cedar Fort, Eagle Mountain Blvd which goes straight to city center, and Pony Express Pkwy, which was extended east to Redwood road in Saratoga Springs in 2010. This was done to facilitate access with the rest of Utah County via connection with Pioneer Crossing, the east-west connector from Redwood Road to I-15. 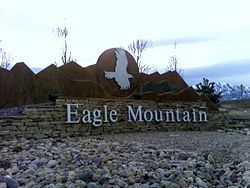 In 2008, the Utah Transit Authority (UTA) began service on an express bus route (#806) into Eagle Mountain. It is the first UTA bus to service the city. ^ "Archived copy". Archived from the original on 2014-03-05. Retrieved 2012-02-25. CS1 maint: Archived copy as title ( link) 2010 Census Information. Accessed November 9, 2011. ^ §10-2-301[ permanent dead link] of the Utah Code, last amended in 2003. Accessed 2008-06-14.